Discover what your digital footprints reveal about your psychological profile. This demo predicts your psycho-demographic profile from digital footprints of your behaviour. It reveals how you might be perceived by others online and provides academically robust insights on your personality, intelligence, leadership, life satisfaction and more. We think every citizen has a right to understand their data, but most big tech companies would rather not reveal what is predictable (or profitable) about you. Fortunately, you can now download your social media data and analyse it directly using our tool. See how to use it. 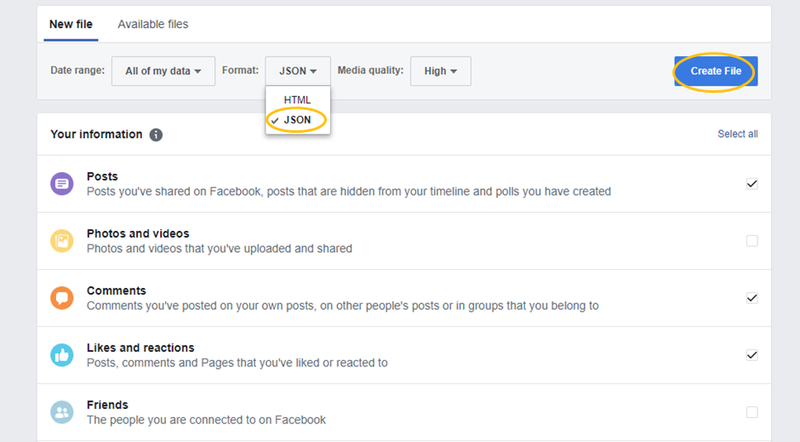 How to get my Facebook data? How to get my Twitter data? 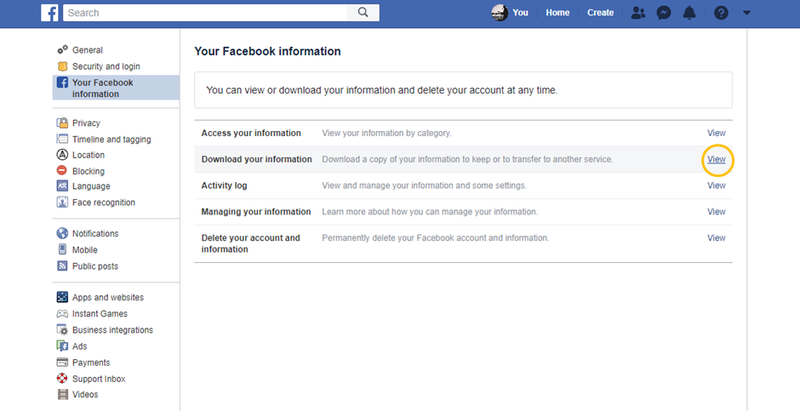 Step 1: Click here to go to Your Facebook Information page and click Download Your Information. 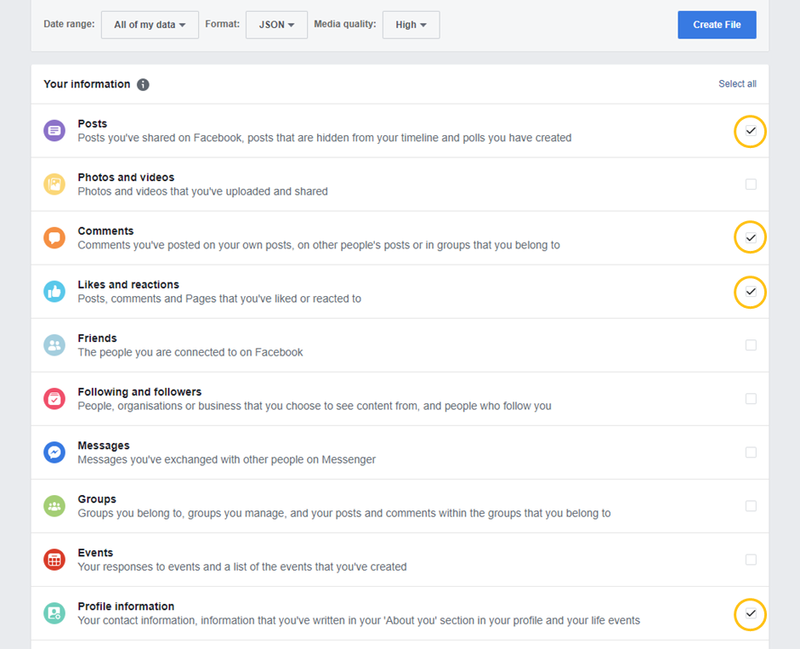 You may need to Log In to Facebook if you haven’t already. You can also reach this page by clicking the down arrow in the top-right, then Settings. Step 3: Select JSON format from the drop-down and then click Create File. Keep the date range as 'All of my data' in order to have the most accurate prediction. If you're in a rush, try a shorter date range. Step 4: Wait for Facebook to generate your file. This can take a while depending on the amount of data, so please be patient. You should receive a notification and email once your file is ready. Go to the Available files tab and click Download to save the zip archive. You may need to re-enter your password. Step 1: Go to https://twitter.com/settings/account. Scroll to the bottom of the page and click 'Request your archive'. This will export all your Twitter data. Note: Twitter unhelpfully offers two places to download your data. The one labelled 'Download Your Twitter Data' contains only information that they 'believe is most relevant and useful to you'. 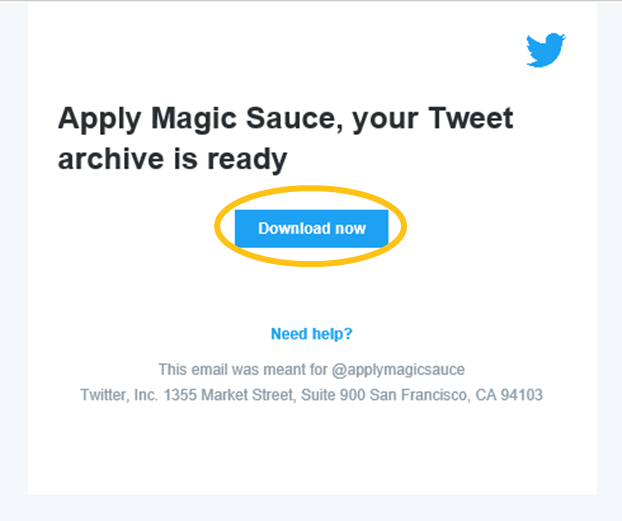 You should ignore this, and download your Twitter Archive instead as shown in the instructions. Step 2: Make sure you have access to the email account you used to sign up to Twitter. It can take a while to generate your file depending on the amount of data, so please be patient. You will receive an email from notify@twitter.com with a unique link to download your data. Our Data Portability Tool allows you to obtain a prediction without needing to log in to Facebook or Twitter. It analyses your social media archive client-side (i.e. on your computer) and only uses what is relevant, so just choose the file or folder that you get from the social media platform and we'll do the rest. Currently supported filetypes include .zip, .json and .csv. We will show you what information has been extracted first and then you can choose what you would like our algorithm to predict your psychodemographic profile from. Data is only uploaded to our server when you click 'Make Prediction'. You will always retain control of all data you anonymously share with us, even if you lose access to your Facebook or Twitter account. We generate a unique ID for you to read or delete it at any time. Our prediction is fast but downloading your data is slow, so please check our tutorials on downloading your data if you need help. You will receive insight on a wider range of psycho-demographic traits if you use the Data Portability Tool compared with logging in, not to mention the pride you will feel at having successfully exercised your rights under Article 20 of the GDPR. So we think it's worth it. Our prediction method is published in the Proceedings of the National Academy of Sciences and our research data has been used by 80 Universities in 45 peer-reviewed articles. By using this demo you are contributing to scientific research and helping to raise awareness of privacy issues worldwide.